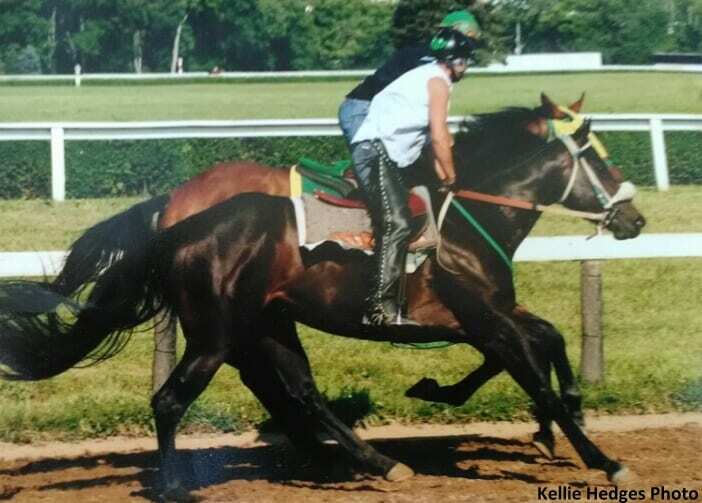 On June 26 at 7:30 in the morning, Kellie Hedges was breezing a filly alongside a friend at Belterra Park near Cincinnati, Ohio. Without warning, the filly's front legs gave out from under her, propelling Hedges to the ground and rolling over top of her. The filly got up, apparently unfazed, and was eventually run down by outriders. Her rider was not so lucky. The accident happened on the inside rail shortly after the half-mile pole. The track ambulance was parked, as usual, outside the track at the maintenance shed by the three-eighths pole. Witnesses say it was a matter of several minutes before a single EMT came out to check on Hedges. He asked her if she could walk, and helped Hedges limp the 30 feet to the outside rail, then to crawl under it, in order to reach the ambulance. Meanwhile, morning training continued on the racetrack, horses galloping past the fallen rider. Once Hedges had reached the ambulance, she said security guards on a golf cart came over insisting they see her license. Exercise riders rarely carry their license on them when on the track, as anything inside a pocket can easily be lost during gallops. Hedges said the security guards insisted that she exit the ambulance and ride in the golf cart to the stable gate, in order to check on her license. “I was telling them I was hurting, that I needed to go to the hospital, and that I needed to make sure my boyfriend knew it was me who had fallen,” said Hedges. Her license checked out, so Hedges was taken back to the ambulance via golf cart. By that time, a second ambulance had arrived to take her to a local hospital. Once there, doctors realized Hedges would require emergency surgery in order to save her leg, and sent her to the University of Cincinnati Medical Center. Hedges suffered a broken leg, five broken ribs, and a broken clavicle. Swelling in her leg was so bad that the doctors had to perform a fasciotomy, cutting slits down each side of her calf to relieve the pressure and leaving tubes in so that it can continue to drain. She has already gone through two surgeries, and will go under again in the next several days to repair the clavicle, which isn't healing properly. In the future, doctors have said she might require skin grafts to repair the fasciotomy on her leg. Throughout her ordeal, Hedges doesn't remember ever seeing either of Belterra's two outriders on shift that morning. Witnesses say they were standing together near the gap after catching the loose horse, never going to check for a fallen rider. During her career, Hedges has served nearly every job on the track, including seven years outriding at the old Beulah Park. In fact, she remembers very clearly the day in 2005 that Josh Radosevich went down in a race and was killed. Ohio State Racing Commission executive director William Crawford could not be reached to comment on the June 26 incident. This entry was posted in NL Article, Ray's Paddock and tagged ambulance, belterra park, emt, josh radosevich, kellie hedges, outrider, racing industry, rider fall, The Jockeys' Guild, university of cincinnati medical center by Chelsea Hackbarth. Bookmark the permalink.